Twelve new double-sided mapboards featuring the devastated terrain of Stalingrad. Three die-cut sheets of map overlays, markers, and tokens. Seventy-two Soviet infantry figures with sixteen squad bases. Ten Soviet tanks, including the brand-new T-70 light tank. Twelve new Operations cards, including the stats for the German sIG 33b assault gun. In addition to the physical components of the expansion, we’ve also added all the rules you need to play Tide of Iron scenarios in the dense urban terrain of war-torn cities such as Stalingrad, Caen, or Berlin. There are rules for movement and combat within multi-level buildings. Below, you can see the example of play that we created to explain how LOS works with multi-level buildings and other terrain. Each new rule that we’ve presented includes examples of play to make sure that they’re easy to understand and can add tactical detail to your games. Of course, once you have multi-level buildings, you’ll want to blow them up, right? That’s why we’ve added rules for destroying buildings in an urban environment. These rules are based on the destructible buildings rules from the TOI: Normandy Campaign expansion, but have been modified to handle larger heavily-built factories and apartment buildings. In addition, we’ve added the sIG 33b assault gun, a German bunker-buster which fires the Stielgranate 42 round, which gives a +6 to attacks against buildings. Yeah, that’s right: a +6. We’ve also included rules for setting and spreading fires. Please keep in mind, though, that we have not actually changed any of the core rules from the TOI base game or Normandy expansion. These new rules supplement those rules, not replace them. Thus, you still use the Normandy buildings rules when playing scenarios set in rural areas, but switch to the Stalingrad rules for combat in major cities. Finally, we’ve added four new specializations: Cavalry, SMG units, Commissars, and Soviet Assault Engineers. There is also a new type of token that can be added to a squad: the restriction token. A restriction token is a limitation to a squad that persists until the squad’s owner removes it in some way. The two restrictions in Stalingrad are “Starving” and “Unarmed,” which help simulate the hardships experienced by both sides in the battle. Tide of Iron is already a great game but then you tack on an expansion like Stalingrad and the game has a lot of interesting new ways to play. 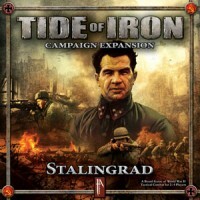 A game overview and review by "The Chief"
Add a Review for "Tide of Iron: Stalingrad"